High on my list of things to do at the recent KC live shows was “Pick up a copy of the 2015 Tour Box”. After much post-gig queueing – with not a little consternation that it might in fact sell out given the number that were being snapped up – I got one in my sweaty hands, or more accurately into the very tasteful KC Elements carrier bag that was given away with it. Don’t they know we have a carrier bag charge here in Wales, where should I send my 5p? Anyhoo, on to the artifact in hand. 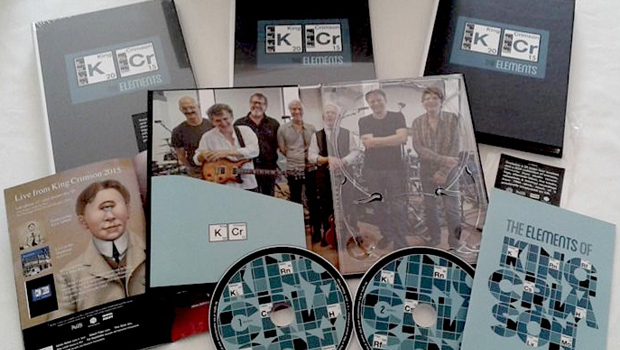 Simply put, The Elements 2015 Tour Box is a delightful addition to anyone’s KC collection. Robert Fripp and David Singleton have done, and are continuing to do, a spectacular job in disseminating the KC archive, live and studio, for the delectation of the fan hungry for more and this is no exception. It’s a beautifully packaged thing, the booklet featuring an illuminating essay by Sid Smith plus great images. The music itself is a fascinating listen and, as you would expect, as far away from a quickly cobbled together cash in as you can imagine. Great care has been taken to make this work as a unified listening experience and to sound fantastic too. It draws together elements from the earliest days of the band in 1969 right through to the 2014 U.S. tour and doesn’t skimp on the ’80s period which is missing from the current tour setlist, making it an alternative career overview, laid out as it is in largely chronological order even if the recordings are taken from performances by later bands. 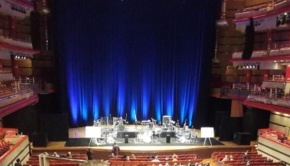 From the atmospheric opening extract of Mellotron “wind” used on 1969’s In The Court Of The Crimson King (as opens the 2014 Tour Box) we move on through fascinating instrumental mixes of Epitaph and Catfood and on to Bolero from the Lizard sessions with bass overdubbed by Tony Levin. This is a wonderful piece with plenty of additional blowing from the brass section. Islands is featured with an extract of the title track which is simply gorgeous with beautiful instrumentation. From the same sessions the feverish drumming and guitar of A Peacemaking Stint Unrolls is a link between Islands and what would follow, with familiar sections included that did just that. 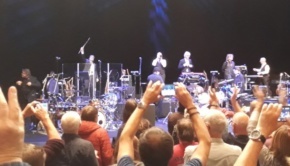 Larks’ Tongues In Aspic, Part II is next, firstly as a 2014 rehearsal extract with Fripp explaining to the rest of the band how the guitar changes are going to work. Raw, tentative and exploratory it is followed by the real deal, live and dangerous in 1974. Also from ’74 is a great live run through of Fracture, a classic Fripp tour de force that is as malevolent now as it was then. Moving to Red we get a guitar extract from the studio sessions for One More Red Nightmare that again acts as a rough intro to the full piece recorded in 2014 with Jakko Jakszyk singing, the first vocal piece of this set. To the ’80s band now with the extended 12″ mix of Elephant Talk followed by a pacey and Stick heavy instrumental Absent Lovers from the Beat sessions that incorporates a great live feel, Frippertronics added to good effect. Fitting in nicely at this point is a 2014 soundcheck extract with a particularly ’80s feel. To round off the ’80s quartet and the first disc we get a mix of Larks’ Tongues In Aspic, Part III and Sleepless from the Three Of A Perfect Pair sessions, another great live in the studio segment. Over on disc two we start the ’90s with all hell breaking loose on Jurassic THRAK, a thumping studio blast from the THRAK sessions. Slightly out of sync but fitting in well at this point is a new piece that the band are currently playing live, the drum trio The Hell Hounds of Krim, again recorded during the 2014 shows. Next a couple of tracks live in 1995, VROOOM and its coda, Marine 475, the Double Trio in all its glory. From the ProjeKcts “research and development” period we get ProjeKction from ProjeKct 4 (Fripp, Gunn, Levin, Mastelotto), recorded live in 1998 and clearly showing where the band were heading for The ConstruKction of Light, the title track from which we get from the studio sessions coupled with Larks’ Tongues In Aspic, Part IV, both in very different and much rawer versions. Back to the ProjeKcts for ProjeKct 3 (Fripp, Gunn, Mastelotto) and Sus Tayn Z from 2000, which is very enjoyable and sounds much as the title suggests. The Power To Believe is represented by a 2002 demo of Part II, the gamelan percussion as engaging as always, followed by a live version from 2003 with extended soundscaping. There’s a very funky unreleased Ex Uno Patres from 2004 featuring Fripp, Belew, Levin and Mastelotto which is interesting as a pointer to where KC may have gone after The Power To Believe if hiatus hadn’t followed. It’s smoother than the angular ‘Nuovo Metal’ path they were following previously and mightily enjoyable. A jump forward to 2010 and the A Scarcity of Miracles, released as a ProjeKct album, and a fascinating take of The Light of Day, part smoky jazz with great flute from Mel Collins and a sinister Fripp guitar stalking the background. This version shows another side of the Jakszyk, Fripp & Collins album and the link to the new KC that subsequently emerged. To my ears this is superior to the album version which was probably used as a better fit to the rest of the material. 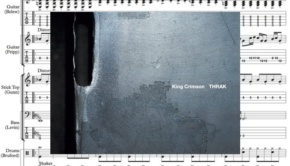 We drop back again to 2008 next for a glorious Gavin Harrison / Pat Mastelotto duet on Ba Ba Boom Boom and then even further back to ATTAKcATHRAK from 1996 before coming full circle to round things off with a thundering 2014 live version of the track that started it all in 1969, 21st Century Schizoid Man which, tantalisingly, is listed as being from the “forthcoming USA II album”. Over 140 minutes, this really is a stunning listen from start to finish, the familiar mixed with alternative versions and new material, all presented in sound of the highest clarity. All of the various eras of the band are represented and the choices made for inclusion are fully vindicated by the quality of the material. The rarities included are fascinating and the integration of the current band throughout the set is very well done indeed with the bonus of one of the new pieces that is now in the live set. Clearly aimed at the hardened fan there will also be much to enjoy for the uninitiated listener but there are certainly easier ways to start ones devotion at the altar of the King. Once the current run of touring is completed you’ll still be able to pick up a copy from various outlets and I can’t recommend it highly enough if you have any interest in alternative goings on within the KC universe. 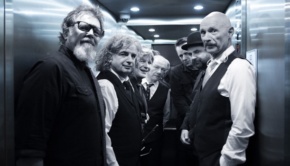 Almost everyone who has appeared in King Crimson plus others…too numerous to list here.